We thought that we should give people an update on how things are shaping up on Arcadecraft! Arcadecraft was put into Peer Review about two weeks ago on the Microsoft App Hub. It was sitting at 91% through the process after about 5 days of being available for App Hub members to test out. During this time, one reviewer found a problem in how the game handles memory (it runs out). The issue discovered was quite rare, and only reveals itself after around 3 straight hours of play. In a bit of a panic we went looking to see what was causing the problem with the game that we thought we had previously solved a few posts back about optimizing our artwork. Turns out that the way we went about handling our assets caused an incredible memory bloat. Once it was known we did an 18 hour or so mad rush of work where we were able to solve the memory problem completely! In fact it solved it so well that there is now room left over for a good 30 or so more machines in the game, that we can add if/when we do an update! The savings were also so great that the overall game smoothness has been improved and we were able to load certain higher res textures back into the game! However, as it was unknown what would happen if the original build hit 100% in Peer Review and we had the updated fix available in the meantime we decided to pull the previous build from Peer Review. This caused a full week penalty from being able to submit the game to Peer Review again! We did this simply because this new build is the far better experience than the older one and we would much rather you play something that isn’t going to fail on you. Well, the week long penalty is over and Arcadecraft has once again returned to Peer Review! If it is able to pass through the process by Monday or Tuesday you may be playing the Xbox 360 version of the game as early as the 31st of January! We certainly hope this is the case and if so you can expect a press release, new media, an updated FAQ, roadmap, price, and a game to play! In other news, last weekend (Jan 19th) Firebase Industries attended the Vancouver Film School Game Design Expo. 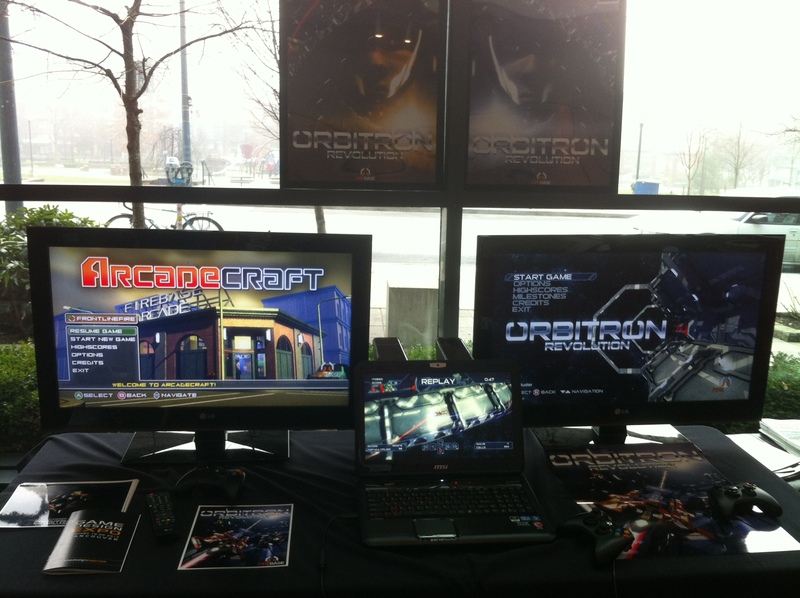 At the event we had a table set up with the latest build of Arcadecraft as well as Orbitron: Revolution! A great time was had and we talked to a good number of people about our games and recieved some fantastic feedback!